Awning and Bounces | Tirpal Udyog - Tarpaulins, Canvas, Silpaulin, PVC Coated, HDPE/LDPE Coated Fabrics, Drill, Twill, Suede, Air Mesh..
We have a wide range of PVC coated fabrics used for Awnings, Pond Lining, Tents etc. We can manufacture 350 GSM to 1500 GSM and single-side coated or double-side coated fabrics as per customer requirements. 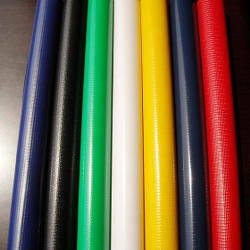 We are offering a large range of PVC Single Side and Double Side Coated which are available in a variety of colors, sizes and thicknesses. Manufactured in varied thickness, these fabrics are used to meet applications across architectural work, mesh making, as Awning and Bounces, as geo textile etc.